The "SkyLight" is an adjustable bracket that holds a cell phone in proper alignment for its camera to look into any ordinary eyepiece. I have no connection with this thing, just heard about it a couple of days ago and thought it was interesting. It's very interesting. Thanks for the link, Rik! There are lots of potential uses, not just in telemedicine and outreach. There have been many times I've wanted to have a pathologist review suspicious cells in a patient specimen after hours or on weekends. Most labs have no ability to take photos, so you're left waiting until at least the next day before the consultant can actually look at the slide. If there are few funny looking cells, it can be quite time consuming, and unless you're standing there showing them yourself, you never know if they're looking at the same thing you saw. Even using stage position coordinated can be dicey if they're not using the same microscope, or they don't pay attention to them. Emailable photos would solve the problem nicely, plus allowing archiving for training and competency review. I've just emailed them to find the best way to get my hands on one. A couple of weeks ago I met up with the designers of the SkyLight. I had set up a bunch of BH-2s, an AO Series 10, and an old Leitz stereo microscope for microscopy outreach at a regional robotics competition. Andy and Tess were kind enough to bring along their current prototype SkyLight. The device is made from injection-molded plastics and seems pretty robust. We were able to attach it to all of the microscopes easily, and tried it with several different smart phones including two different iPhones and my Droid Charge. The platform allow the phone to be easily moved horizontally and vertically to position the camera lens correctly over the eyepiece and locked into place so you don’t have to continually work to keep it in position. By moving the platform in and out over the eyepiece you can position it for best focus and clamp it in place. A little zooming in and you get a nice, full screen image. Obviously it’s not big enough to support a tablet like an iPad, but there seems to be enough movement available to allow nearly any smart phone camera to be used without difficulty. Photographic quality clearly is limited by the cell phone camera, and will never reach the quality generally posted here, but for quick and dirty documentation in the absence of a dedicated photography system, I think it has a great deal of merit. It’s a pretty impressive little device that I think can be a bit of a game changer in normally non-photographic microscopy. I have several production SkyLights on order to arrive sometime around March. I’ll post again after I get more time to play, put them into the hands of the kids, and a few of the clinical lab folks I work with. 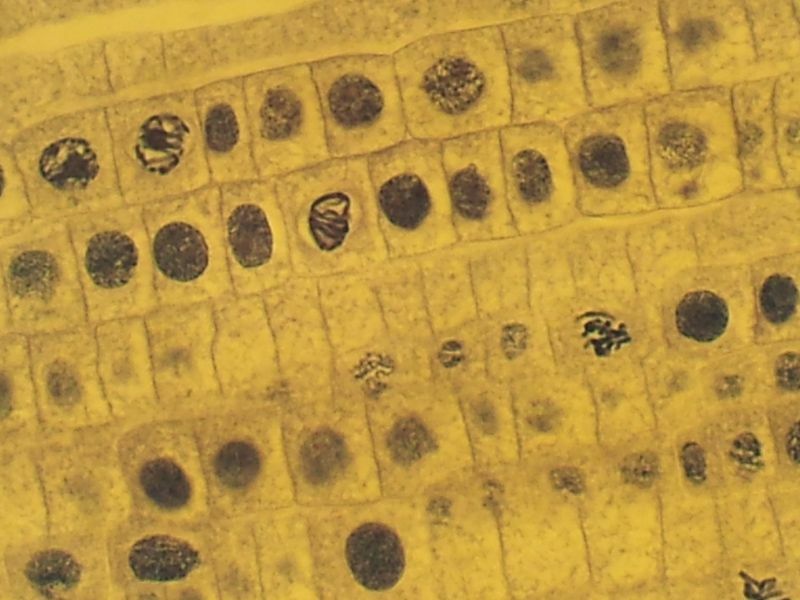 This is a photo of onion root tip from a teaching slide collection. It's not really publication quality, but it's easily nice enough to get the point across. Slight camera zoom to get full to full screen. No crop. The camera is a Samsung Droid Charge. Resized in Lightroom with no other changes.